The definite A to Z of 44 Irish Brown Trout Lakes. Summertime at St. John's Point, Co. Donegal. …fish are jumpin’ and the cotton is high. Now, there isn’t that much cotton growing in Ireland and some people say, last year’s summer, on the 17th of June, was too short anyway. Nevertheless when the livin’ is easy, anticyclones rule, I’m off to the sea. 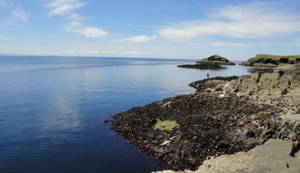 Fishing for mackerel and pollack is not only foraging, but also balm for the soul. Some of the land -and sea scapes are so beautiful, their images are burned deep into your mind; haunt you in the middle of winter, triggering dreams and day dreams. The thrill of anticipation is enormous. Fishing for mackerel is simple, once they are about, and the usual lures all work well. The further you can cast them, the more you’ll catch. Usually. Once you’ve hit the right spot the lure is already attacked on the way down, before you have actually started retrieving. 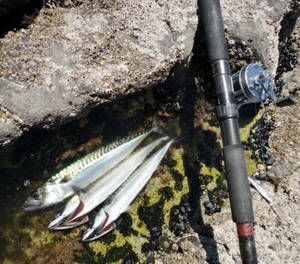 Sometimes shoals of mackerel come in close to the rocks, chasing fry. That is when you want a fly rod with a silvery streamer at the ready. Act and cast fast, the spook will be over in only a few minutes and the mackerel will be hunting fry somewhere else. Should you have a sinking line on your fly reel it is worth fishing deep close in among the rocks, because that is where the pollacks are. They usually take a silvery white streamer also. The only problem is: you have to keep the fish away from the sea weed. Once they are in there, they are lost. The fish that is, because in most cases you’ll get your streamer back. So, I love every minute on my rock platform, soak up the sun, enjoy the day, catch myself a few fish and know for sure: summertime and the livin’ is easy. Usually the trout fishing slows down a lot, once summer solstice is past. End of June, July and August is not the best time to catch trout. No matter whether you fish rivers, lakes or mountain lakes. The fishing can be particularly slow, when in high summer an anticyclone with easterly airflow produces blue skies all around. There are days with almost no wind, high temperatures, rising fish all over the place and not one trout going for the usual wet flies. You wonder why you came here in the first place, walked up a mountain to fish the lakes, instead of going to the beach for a swim. You change patterns, fish slower, fish faster, deeper or closer to the surface, but nothing happens. They are just not taking the wet flies. A general change of tactics and techniques is called for. 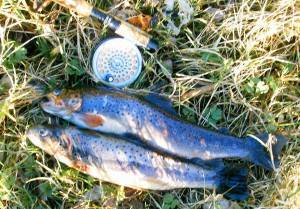 It is possible to catch these rising fellers with a dry fly. In most cases you won’t be able to see what the fish are going for. Just the rings are visible, not the actual fly that provoced the rise. Nevertheless, a dry sedge imitation or a Knotted Midge should work. So, away with the wet flies. Add two foot or so of two to three pound line to your cast and put on a sedge imitation, like Our Sedge. I always start with a sedge size 12 or 14, that's just about right in most situations. Our Sedge works very well on the mountain lakes, the trout here just love it. Now, in order to catch fish you have to hit the rings of a rising trout, immediately after the fish broke the surface. It will, no, it somehow has to come up again to take your dry fly. A reflex seems to be triggered and the fish will at least show an interest in your sedge and swirl at it, but often it will take. Beginning with casting on seeing a rise is much too late. By the time your fly swims where the fish rose the prey will be somewhere else or back at the bottom. You have to be doing false casts all the time, whilst walking along the bank looking out for rises. You have to be able to keep the fly in the air all the time. · They fend off the midges, because they will be out on days like this. When a rise appears just let the line shoot. Immediately. The dry fly ideally lands in the spot where the trout rose, swims there for a second or two, and hey presto, there is your trout coming up again, taking the sedge. Just strike and play the fish. It is as easy as that to catch rising fish in bad conditions, like blue skies, high temperatures and no wind in the height of summer.